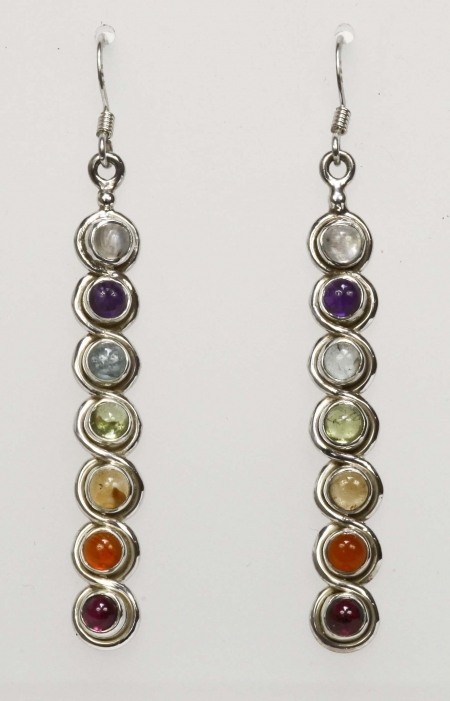 Matching simple sterling silver chakra earrings with a fishook fitting, set with cabuchons of garnet, carnelian, citrine, peridot, topaz, amethyst and rainbow moonstone. Each earring weighs 4.5 grams. For further information about chakras please go to our News page. Clean jewellery regularly with a silver polishing cloth to prevent the build up of damaging tarnish. Stones can be wiped clean with a damp cloth.